The ATMs are called ABMs. Don’t be alarmed if there are armed guards next to the ATMs, they are there for protection. Goats will be walking around everywhere and they return to their homes at night. The goats are like dogs and if you try to get near one and it doesn’t know you it will make a fuss and run. If police see you they may approach you like you are trying to steal someones goat. And the police may be looking for money, so leave the goats alone. The tap water potable and we drank it a lot while there even in restaurants away from our hotel. 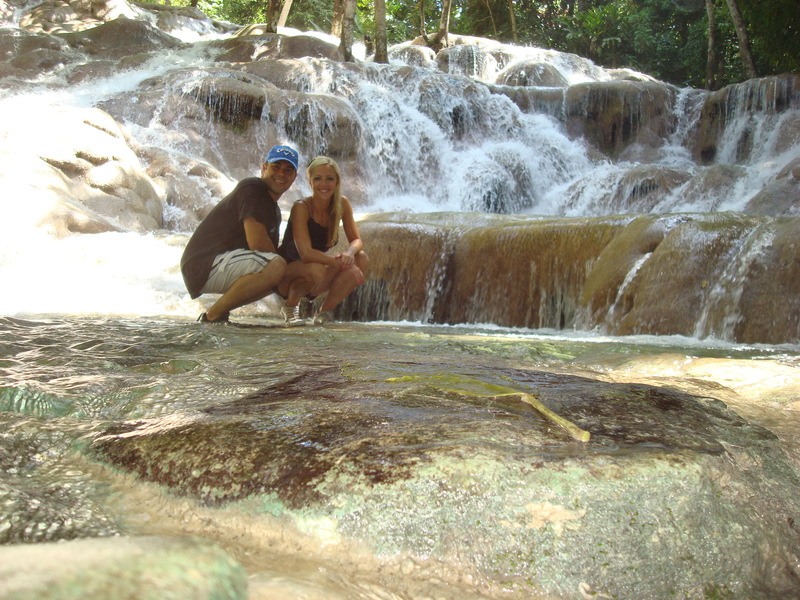 Dunn’s Falls are 600 ft from bottom to top and they are gorgeous and fun to climb. There will be camera men offering to hold your camera and walk with you like a guide. They are not affiliated with the park, and they will hold your camera until you pay them at the end. If you want them to take pictures of you while walking up, and then just plan to pay them when you are finished, otherwise tell them no thanks and don’t give them your camera. There are multiple entry (or exit) points for the waterfall. If you want to climb the whole thing start at the bottom where the ocean is. Or if that is too much start higher up. You can always start at the bottom and get off when you want. The shopping at the Dunns is overpriced even when you bargain. Ask your tour guide if there will be more shopping than just at the Dunns. Take a look around and if you don’t want it just politely say no thanks and walk away. They will leave you alone if you are polite and direct about it. When Leo and I went we went when the cruise ships weren’t there and we pretty much had the park to ourselves. Even then we never felt threatened. They are just like anywhere else just trying to make a buck. Be prepared to hear Bob Marley everywhere. Tipping: If you eat in a restaurant in Jamaica it will most likely have a service charge of 10% which does not go to the waiters. They expect a 10-15% tip on top of the service charge. Although don’t ever tip if you don’t feel it is warranted. It is customary to tip 10-15% for taxi drivers (for metered cars) and tour guides. Some taxi’s are not metered. Always agree on the price beforehand with taxi drivers. Sandals Whitehouse Resort: We stayed at the Sandals Whitehouse Resort in Jamaica. It is a couple only resort, no children allowed. If you want to stay at their sister company hotel, you would stay at Beaches which is family oriented. Sandals resorts are all inclusive which includes everything, food, drinks, scuba diving, water skiing, sailing, wind surfing, kayaking etc. They have resorts on other islands as well. 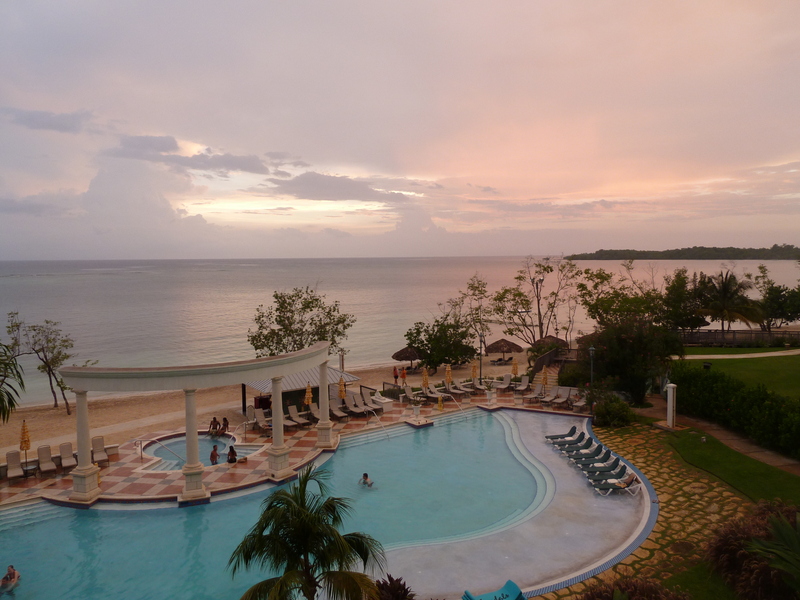 They have about 7 resorts in Jamaica. The resorts closer in town don’t have near as big of a beach, but you can pay to stay at one, then eat and play at 2 other locations depending on the resort you chose. The ones closer in town have more of a night life than the Whitehouse Resort. September is low tourist season in Jamaica and we never had a problem trying to find a beach chair. The beach was so big that it felt like you almost had it to yourself. Not a lot of people signed up for water skiing or other sports, so you pretty much had your pick of what you wanted to do and when you wanted to do it. 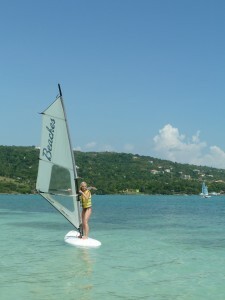 The hobi cats and wind surfing was fun. Their skiing and wake boards were nice equipment. The scuba diving was just okay, we saw sea pearls, a turtle, lion fish, jelly fish and lobster. They spear the lion fish because it is a predator and will eat hundreds of infant fish each day. I saw about 6 speared. 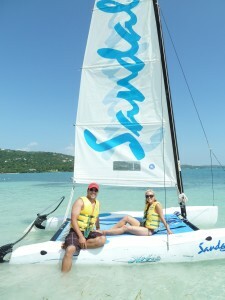 One couple said they saw dolphins in the distance when they went sailing on the hobi cat. All rooms have an ocean view, although the top rooms are the best for the views. We stayed in the middle of the three villages- The Dutch Village, in the penthouse honeymoon suite with concierge service. 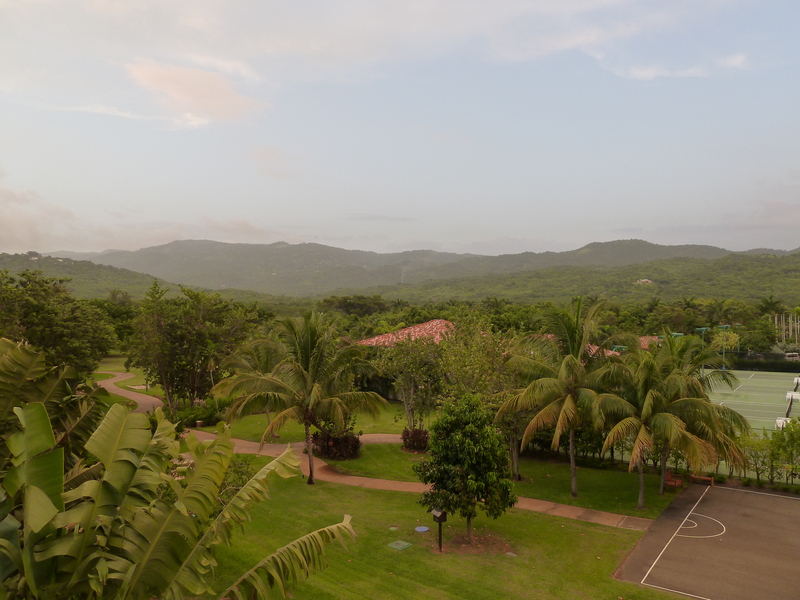 It had the best views and best pool and it wasn’t too far away from all the activities. It over looked the spot where people got married. We saw a wedding about every day. At night you could sit on your balcony and watch the sunset. The best restaurant there is Neptunes, in our opinion. The Bakery could be better if they had fresh fruit with their crepes instead of canned fruit. Don’t bother going to the grille in the French Village, the service was slow and it too over 35 min to grab a hot dog. I have heard the grill was slow from multiple people as well. 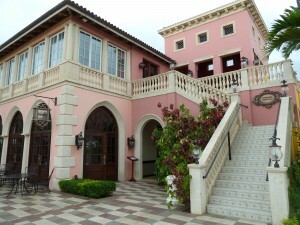 We had a 2 hr bus ride to the Sandals White House Resort from the airport. I thought the road to the resort would be worse than it was after reading the reviews. It was fun to see the island and I enjoyed the road to and from the airport. It is far from the Dunn’s Falls and Glistening Lagoon which is the only downfall of this location. Those two things are really neat to see. 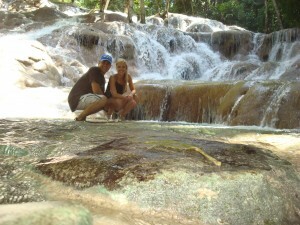 We paid $370 for another tour company to pick us up, and then drive 3 hrs to the Dunn’s river Falls. We paid $40 to get into the park. We got a to-go packed lunch from the hotel which they gladly did for us. We hiked the falls from the bottom without a tour guide. We went on a day the cruise ships don’t come in so it wasn’t crowded, it was a Tuesday. The shopping at the Dunn’s Falls is overpriced. Our tour guide took us to another shopping center and we got better deals on earrings, hats and kid’s dresses. We then drove an hour to the glistening lagoon and ate dinner there at a restaurant. It is located next to the cruise boats docks in Falmouth. Then we went out on a boat from the restaurant at night to see the glistening waters on the luminous lagoon. There are only 4 places in the world where the water glows at night. It is in brackish water (70% salt and 30% fresh water). 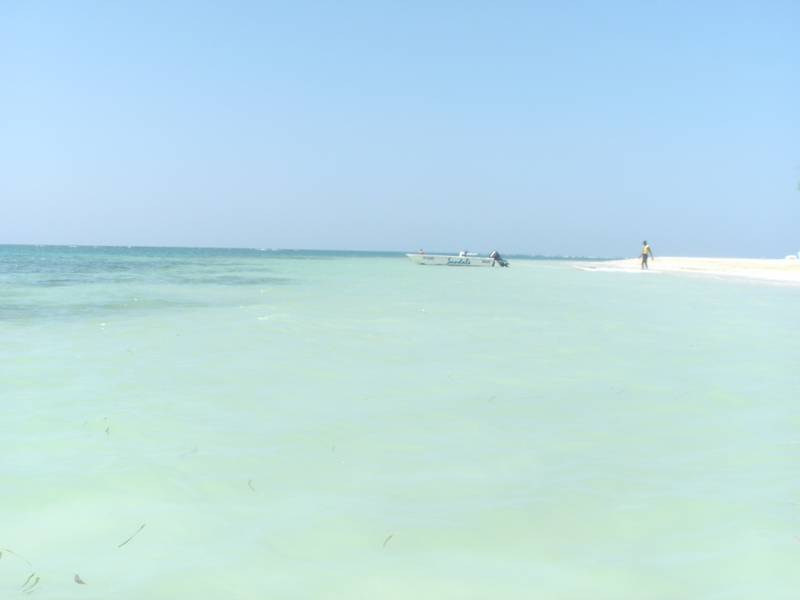 It is warm water that is shallow about 3-8 ft deep. Micro-organisms live in the brackish water and when agitated, glow fluorescent. You can swim in the lagoon and it just glows around you. It was really neat to see!!! The conditions were perfect for the glow, the moon wasn’t full and it wasn’t raining, so it glowed really bright! If you go make sure you bring a good camera to take pictures of it. We brought a cheap water one since we swam in it and it wouldn’t capture the glow. It was a long 4 hr drive back to the resort but it was worth it. 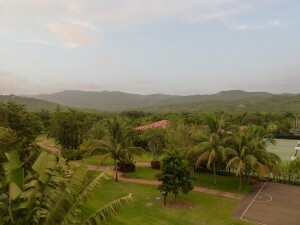 Included in our hotel price was a free horseback riding tour which was normally $100 per person. I thought it would be on a bunch of under fed horses with a ton of people, but it was actually our most favorite thing of the whole trip. It was on a huge ranch. The owners take good care of the horses and there were only 2 other couples with us. This one was close to the resort, just a short drive, maybe 30 min. 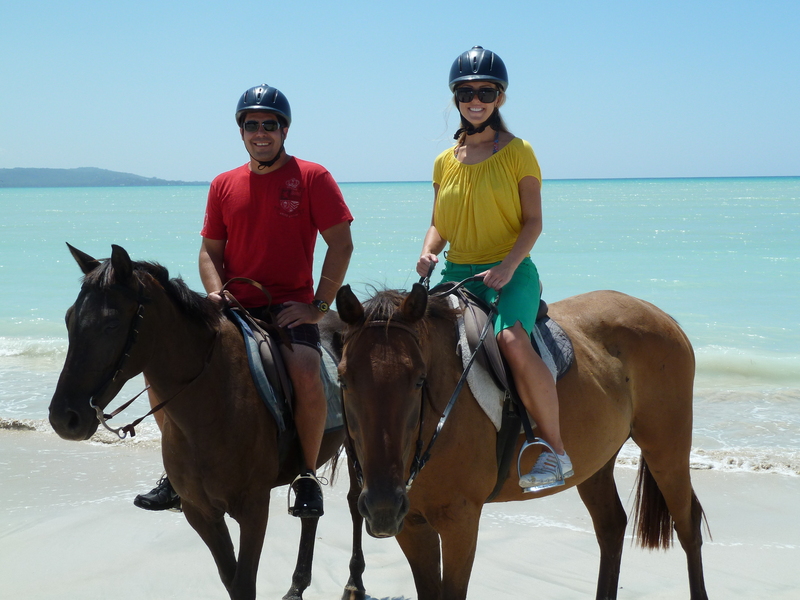 We were on the horses a long time and rode them on the beach. It was beautiful and on the way back they let my husband and I run the horses since we knew how to ride. After they let you swim in a river and you can jump off the edge of it. It was really pretty. We also had a spa credit with the room so I got a free pedicure and manicure, only had to pay for the tip. If you go out on the sand at night you might get bit by sand flees, where bug repellent if you have some. I love that you can get professional photographers to take pictures of you and you don’t have to buy the pictures unless you want to. 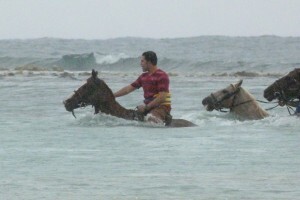 Chukka Tour Review: Our second time to Jamaica we did an excursion with Chukka tours for the Horse Ride and Swim. It was about a 45 min bus ride there from our cruise ship in Falmouth. Last time we were in Jamaica we did a horse ride tour and it was one of our favorite things to do in Jamaica. I don’t remember the name of the last company we went with, but it was on a more secluded, was a prettier area than this one. Last time there were only with 2 other couples and they let us ride side by side and even run the horses as fast as we wanted. The other tour would tell us about the vegetation and the family who owned the farm were the guides. Chukka is owned by a Canadian and the guides just work there, they don’t own it. They didn’t talk about the vegetation; instead they sang Bob Marley songs (off tune). Being with the cruise of course we are going to have lots of crowds. It also poured rain on us the entire time, so the pictures didn’t turn out as well, and it was quite cold. Our tour guide wouldn’t allow my husband to ride side by side with me, so instead we were in a straight line even though there was plenty of room on the trail to ride side by side. My husband thought that was ridiculous, but our guide was a stickler about it saying he isn’t the owner, to the point that my husband didn’t tip him. It would have been more enjoyable if they didn’t make us ride in a straight line for an hour. I rated this tour good rather than average because with all the times that I have been on a horse I have never been bare back while the horse swam in deep water. After you ride the horses with a saddle on the trail, you get a different horse and you take off your shoes and anything you don’t want wet and you go bare back in the water. I thought we would just walk through semi deep water once, but instead you get on the horse and they make the horses swim in deep water. It is actually how they train wild horses, by wearing them out in the water to the point they don’t care if you ride them anymore. So when the horses go in the water they get a little wild. 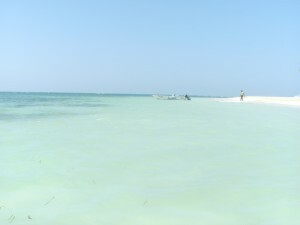 There are a few sand bars that they can run on in the middle of the lagoon and the guides will yell at the horses to make them run fast. They were actually trying to knock one of us off the horse and the guide charged my husband’s horse trying to make him fall, however no one fell and it was fun running with them in the water. They take pictures of you while you are in the water, but we weren’t aware they were taking pictures the whole time. They should have told us they would be taking pictures the whole time and they should have paired up the couples for the swim. My husband was about 5 people ahead of me and once you are in the water it is really hard to get together especially when the guides are charging my husband who was at the front of the line. They would have sold us more pictures if we were together and they told us they were taking pictures of us. The horse they gave me was a little skinnier than other horses and the spine of the horse was killing me especially when it would run. They have lockers there if you want to lock up your valuables for a fee. We just left our sunglasses and valuables on the bus. Bring a towel because we didn’t and we were wet and cold the entire drive back. They have pictures you can buy. 7 pictures costs $25 usd. They have other packages as well. They have a restaurant and beer there if you are hungry. I didn’t like seeing all the stray dogs around there. In all the places of Jamaica that was the only place I had seen a couple of starving stray dogs. I wanted to feed them and was happy to see another tourist giving it chicken. 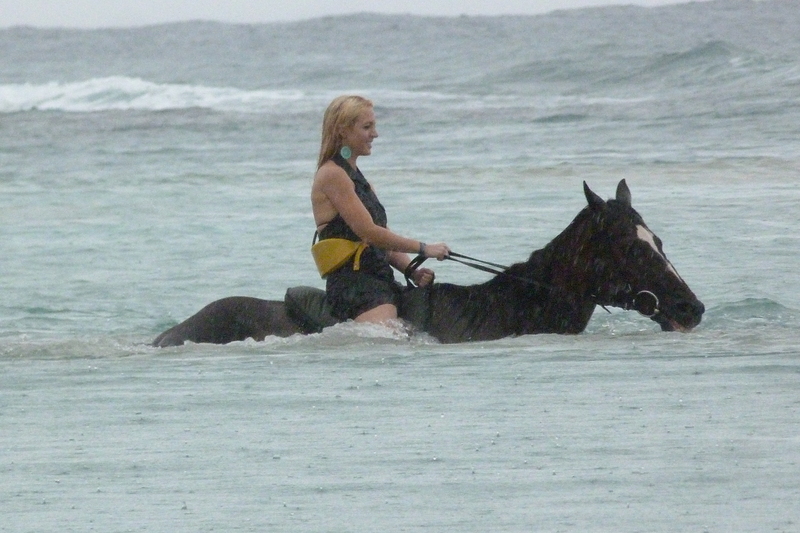 I would recommend this tour if you want to swim in deep water with a horse, it is a unique experience. It would have been more enjoyable if the guides would let you ride side by side and if the guides would talk more about Jamaica and the surrounding area. Make sure you are next to your family or friends before you go into the water for pictures and smile the entire time you are in the water, even when the spine of the horse is hurting you. They finally pulled us together to take a quick photo at the end of the swim, but we were not together for the rest of the swim. I also wished I hadn’t worn the life jacket around my waist, I am not sure if they make you, but at the time I assumed they did otherwise I would not have worn it.